This project is already complete and has come up quite well. 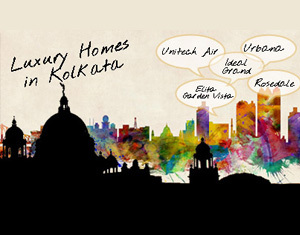 The buildings are very well spaced out compared to other south Kolkata properties. It also has an water body inside adding a new dimension. Overall a good development. The much venerated Diamond group presents Diamond city south. Located near the Tollygunge metro station facing the golf course at Tolly Club, this project consists of 4 towers each of G + 22 storeys. Comprising of 2 and 3 bedroom apartments & penthouses, the project houses over 500 apartments with modern amenities of the project includes state of the art club facilities, landscaped gardens, Children's play Area etc. 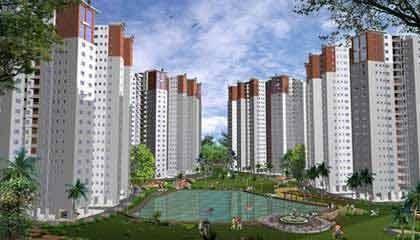 Being loacted in Tollygunge, the project is less than 5 minutes drive from the metro station. The Tollygunge railway station is just 7 minutes away and the Tolly Club Golf course is just across the road from the site. The lake gardens flyover being minutes away, makes EM Bypass easily accessible from the project. Premier educational institutions like South Point and Pathabhavan are all within 15-20 minutes drive from the project. The Diamond Group is a consortium of some of the leading developers and promoters in Kolkata who have the credential of constructing over five million square feet of residential and commercial complexes. They have a reputation of trust and transparency, giving discerning home seekers absolute value for money. Some of their successful projects include Landmark, Siddhartha, Surya Kiran, Convent Enclave, Brindavan Garden, Park View and Centre Point. Diamond Group and PS Group, the brains behind this project has earned a brilliant reputation of trust and transparency, and is renowned for giving discerning home seekers absolute value for money. The Diamond Group have a marvelous eye for detailing and planning, and have to their credit some very successful projects like Siddhartha (Burdwan Road), Brindavan Gardens, (Christopher Road), Lake Towers (Southern Avenue), Landmark (Lansdowne) etc. The PS group on the other hand is active in the fields of IT parks in green building formats, Hi-tech commercial buildings, SEZ's, Retail Space, Hotels, Value-for-money, self-sufficient townships namely Astral Residential, P S Alankar, Jubilee Park, P S Tower, P S Arcade, Akash, Newtown Square, Rainbow, The Grand- Chennai, Sherwood Estate etc mark its project portfolio. Booking can be made in FEW EASY STEPS. 1. Identify your apartment: Our Property Advisor will assist you with full details of the project, viz Floor Plan, Application Form, Cost Break Up, Payment Schedule and other details. 2. Fill up the Application Form and send the same to our nearest office along with the payment of 15% of property value. Rest as per payment plan. You can also opt for easy installment scheme and book you property. 3. Upon clearing of the cheque you will be sent the Money Receipt, Sale Agreement/Allotment letter. Home finance options are available from leading banks. Quality wooden frames with solid core flush doors. Exterior of building: Latest available durable outer finish.